As the south was being hit with hundreds of rockets Thursday, a group of students at the University of Haifa took time today not to mourn the loss of three Israeli lives, but to mourn the loss of a terrorist mastermind who was behind countless attacks and operations aimed at terrorizing the Israeli population. At about 13:00 around 30 to 40 Arab students assembled on one of the lawns of the University of Haifa and stood for a moment of silence in memory of Hamas military leader Ahmed Jabari, who was assassinated yesterday by an Israeli air strike. As the Arabs stood silent some Jewish students, who were obviously offended by the assembly, began singing "Hatikva," the Israeli national anthem. Some university staff members then arrived to calm the situation, but the Arabs dispersed quickly, shouting, "He's dead, he's dead." Arab students promised to hold another moment of silence on Sunday, when the school reopens after the weekend. The University of Haifa said that the incident did not receive university approval. 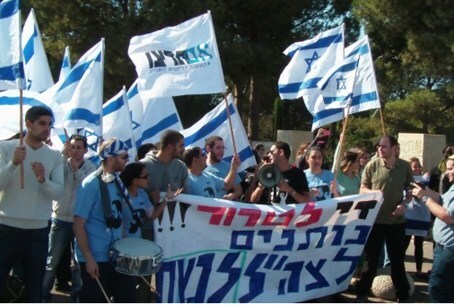 At Hebrew University in Jerusalem, Zionist students organized by the Im Tirtzu movement held a counter-protest as Arab students and leftists demonstrated against Israel.